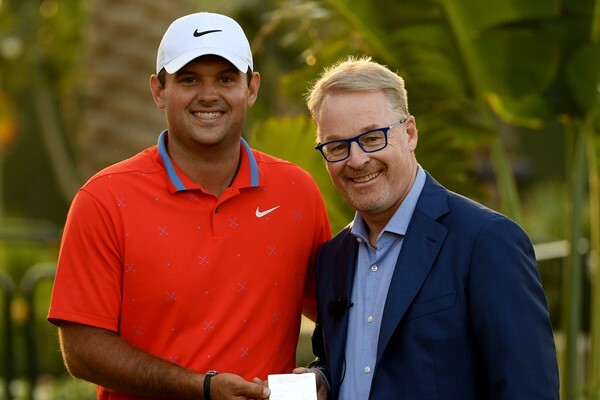 Patrick Reed joined an exclusive club on Friday, becoming just the fourth American player to be granted lifetime membership status on the European Tour—and no one, other than Euro Tour CEO Keith Pelley, seems to understand why he was chosen. "Patrick’s masterful performance at Augusta National last April was full of character and determination, which is everything we’ve come to expect from him," explained Pelley. "Patrick is a global player who has fully embraced the European Tour, and he has been extremely popular with our fans wherever he has played because of that." Jack Nicklaus, Arnold Palmer and Tom Watson are the only other Americans who have ever received lifetime Euro Tour membership and in each case, it happened after they had moved to the senior circuit. Reed, on the other hand, is only 28 and likely has the better part of a decade of PGA Tour membership still ahead of him, if not more. To say it was an interesting selection would be an understatement; the Texas native has long been one of golf’s most controversial and villainized players due to his checkered history at the collegiate level and the arrogance he has shown on and off the course since turning professional. Understandably, reactions to the announcement on social media ranged from confusion to outright bewilderment, as the golf world struggled to wrap its head around why Captain America was chosen over the likes of Tiger Woods, Phil Mickelson or even Brooks Koepka, who came up through the European Tour developmental circuit and has won three times the amount of majors Reed has over the last two seasons. Nevertheless, Reed appeared to be quite humbled by the selection. "For the European Tour to have faith in me and give me this opportunity means everything," Reed said. "I hope to show everyone and the Tour how proud I am and represent the Tour really well in the game of golf." Sergio Garcia’s temper got the better of him in Saudi Arabia last week and as a result, he became the first player on the European Tour to get disqualified for breaching golf’s newly implemented player conduct rules. Rule 1.2a states "players are expected to play in the spirit of the game by acting with integrity, showing consideration to others and taking good care of the course," and Garcia’s actions in his second and third rounds were found to be in violation of all three clauses. On Friday, the Spaniard repeatedly gnashed his club into a bunker on the fourth hole in frustration after needing two shots to get out of the trap. Then, on Saturday, he intentionally ground his putter into multiple greens during play, causing damage to more than one putting surface and drawing complaints from other competitors. The tournament committee, who has the authority to disqualify players for sullying the spirit of the game, looked into the matter and decided Garcia’s tantrums were detrimental enough to warrant the boot. To his credit, the 39-year-old did not dispute the ruling, acknowledging after the round that his actions were indeed out of line. "I respect the decision of my disqualification," Garcia said. "I damaged a couple of greens, for which I apologize, and I have informed my fellow players it will never happen again." In less than one week, the golf world saw two instances of player-caddie duos breaching new golf rule 10.2(b)4 with seemingly innocuous transgressions, and already a host of PGA Tour players are calling for the USGA to change it. Haotong Li and his caddie were the first ones to breach the rule, which states that caddies cannot stand behind players after the ball has been addressed, on the final hole of last week’s Dubai Desert Classic. The two stroke-penalty assessed to Li dropped him from a tie for 3rd to a tie for 12th and cost him £100,000. The other violation occurred just five days later at the Waste Management Open when cameras filmed Denny McCarthy’s caddie standing behind him during his fourth shot on the 15th hole. Immediately after the round, Justin Thomas, Luke Donald and Brandt Snedeker all voiced their intense disliking of the new rule on Twitter. Interestingly enough, that push back from the players affected some change. On Saturday, the PGA Tour announced that it was not only rescinding McCarthy’s penalty, but would also be working with the USGA and R&A in "the coming days to further analyze and improve the situation with this rule." It’s been almost 20 years since fans at the 1999 Phoenix Open famously moved a boulder out of the way for Tiger Woods. To mark the occasion, fans at the Saudi International last week repeated the favour for Brooks Koepka, after the reigning back-to-back U.S. Open champion’s third-round tee shot on the 15th hole came to rest beside a mammoth rock. Ever wondered how the seating selection works at the 16th hole of the Waste Management Open? It turns out it is decided by stampede. This guy won tickets to the Waste Management Open for the entire arena after draining this cross-court putt, although we suspect he might have had a little luck of the Irish on his side.